We started with 64, now we’re here. 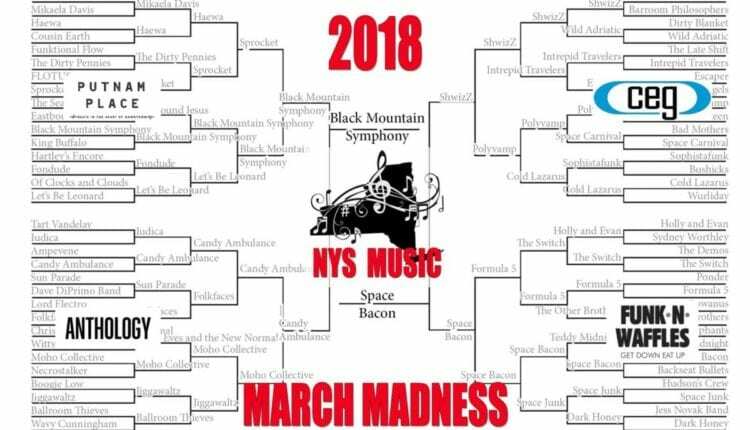 Two artists remain in NYS Music’s 2018 March Madness! Two weeks ago, we started with 64 up and coming artists from across the Empire State, and now there are two vying to take it all in our friendly tournament-style competition. 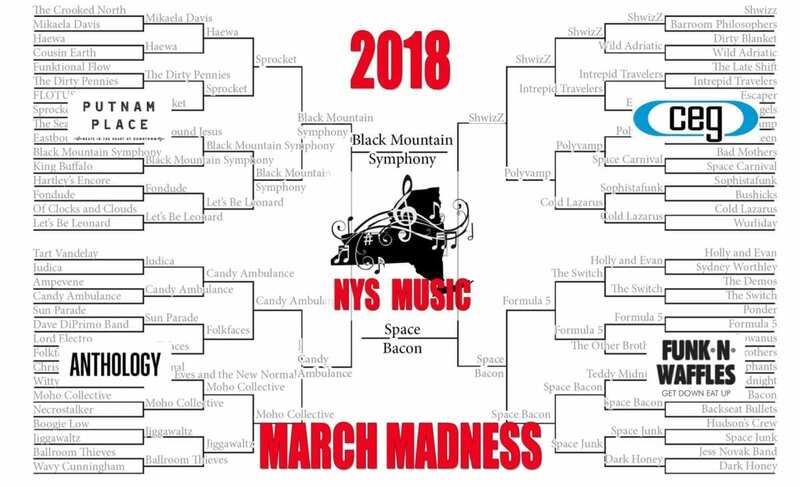 Black Mountain Symphony winner of the Putnam Place division, showcases an eclectic range of influences, blended together to create their own special sound. From baroque classical violin and haunting folk-tinged ballads to funk-rock drums and hard-hitting dance numbers, the six-piece band sprinkles their live sets with hints of everything from classical music to bits of Motown, blues and jazz. Black Mountain Symphony performs both intimate acoustic shows as well as intense, full-band rock shows. Upcoming shows include April 6 The Colony in Woodstock, and on May 18 Flyday Music Festival in East Durham, NY. Brooklyn’s finest jam band, Space Bacon is a jamtronica quartet that weaves composition and improvisation through an ever-changing landscape of segues, inversions, and palindromes. They have two upcoming shows this spring in New York: March 30 with SkyDaddy at Garcia’s and on May 3 opening for Pigeons Playing Ping Pong at Brooklyn Bowl. Finals voting begins at 12 noon EST on Thursday, March 22 and end at midnight on Saturday, March 24. The winner will be announced on Monday, March 26. 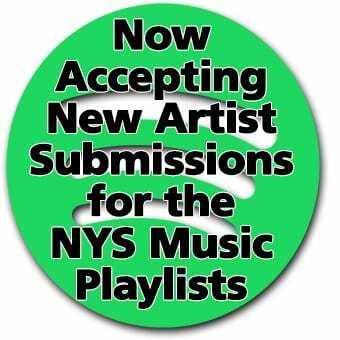 Vote now for your favorite and discover some of the great up and coming music that New York State has to offer!